Faster-than-inflation rising costs and a stall in revenue in the South African platinum group metals (PGMs) industry are exacerbating hardwired challenges that are already threatening nearly 90 000 jobs. Rapidly escalating costs, particularly for labour, electricity and supplies, are fast becoming one of the most significant issues faced by the local market, Minerals Council South Africa CEO Roger Baxter said on Tuesday. In addition to this, the industry remains under threat from a sustained decline in the dollar price, structural changes in global supply and demand fundamentals, domestic labour strife, flat new-mine supply and weaker demand, increased growth in recycling and declining productivity. 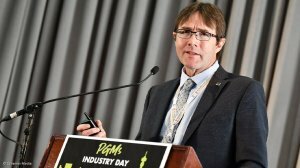 The industry as a whole has managed to contain cost increases; however, the revenue streams have been quite challenging, he told delegates at the yearly PGMs Industry Day, held in Johannesburg. About 89 964 jobs are at risk with 65% of PGM operations, representing 52% of production, currently deemed as marginal or lossmaking. On an aggregated basis, total industry production costs measured in tonnes milled will increase by 29.6% between April 2019 and April 2021, Baxter said during a presentation. By the end of 2021, State-owned power utility Eskom’s tariff increases will result in 75% of PGMs operations being marginal or lossmaking, representing 67.2% of production, and bringing the number of jobs under threaten to 111 766. “[The platinum] industry is still the industry with the most significant number of jobs under threat through formal Section 189 notices than any other industry I am aware of,” added Joburg Indaba chairperson Bernard Swanepoel. “Mineral resources in the ground represent no wealth unless they can be mined safely, profitably and in environmental and community sensitive ways,” said Baxter. “The critical point is what we can do collectively, as industry, as government and as stakeholders,” he added, noting that industry can, in real dollar terms, increase the size of the industry by nearly three times by 2050. Should the global market grow, the value creation, the dividend streams, the payment of taxes, the procurement benefit and the export earnings, besides others, from the PGMs sector will be significant. “Our focus has been on how we create the conversations to get all stakeholders to realise that we are all in the same canoe,” Baxter noted, adding that a collective effort is required to take the industry into “calmer waters”, “fix the holes” and grow.